This filet is absolutely phenomenal! The flavor profile is outstanding and the zucchini gives a nice crunch to this dish. tablespoons of liquid, about 15 minutes. Strain liquid through a fine mesh strainer into a small bowl, set aside and let cool. with two inches of water; bring to a simmer over medium heat. Add egg yolks and vinegar reduction to a heatproof bowl. Set bowl over the pan and whisk constantly until the yolks thicken, about five minutes. Slowly whisk in clarified butter to make a smooth and velvety sauce. Verify seasoning level and adjust with salt and pepper as needed. Keep sauce warm. If sauce thickens too much, add small amounts of warm water to a pourable consistency. Preheat a grill pan over high heat. Drizzle asparagus with olive oil and season with salt and pepper. Add zucchini to grill pan and cook for about 2-3 minutes for crisp tender. Remove from heat and keep warm. Heat 1 tbsp. butter with olive oil in a large skillet over medium-high heat. Season filets with salt and pepper and add to skillet; cook, flipping once, until browned and cooked to desired doneness, about 4–5 minutes for medium rare; keep warm. Wipe out skillet and melt remaining butter over medium heat. Add crab; cook until warmed, 1–2 minutes. 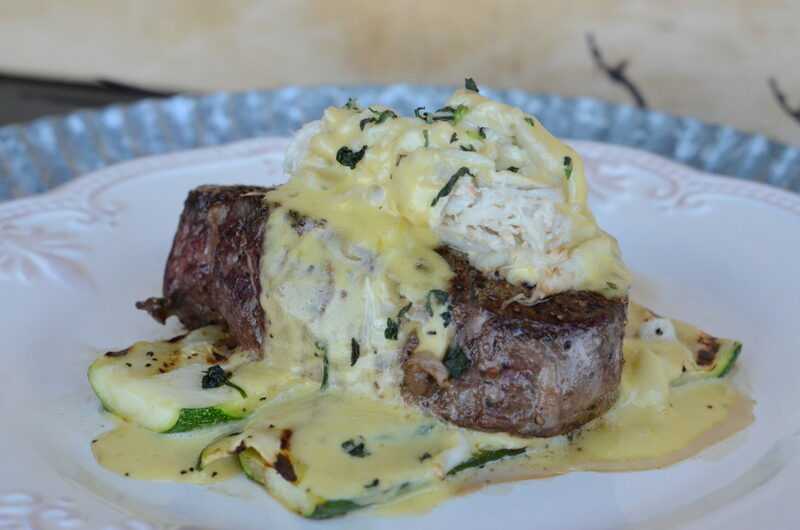 To serve, divide steaks among plates; top with crabmeat and asparagus. Spoon bearnaise over top; garnish with parsley.